As more projects are tasked to a dispersed workforce, project managers need new ideas. Leadership coach Susanne Madsen has eight of them. Here’s a shot of the whiteboard from your reference! There are benefits working remotely, but one challenge that Susanne noted was that it takes an extra effort to make those teams come together and work productively. Following these tips help connect your team to the project and you to your team, which are crucial ties if the work is going to get done, correctly, on time nd within budget. Pro-Tip: There are many ways to manage remote teams, and some other things to think about is hiring the best people and then being clear in your communications so they can excel in the areas they are skilled in. Hi, I’m Susanne Madsen. Welcome to this White Board presentation about working with remote teams. It is a fact that more and more teams work remotely and, as project managers, we need to work extra hard to make the team gel. Let’s look at some tips for how we can do that. The first tip is to meet in person wherever possible. If your team is overseas, that might be a challenge, but try to squeeze in at least one trip. Nothing beats face-to-face interaction. Otherwise, there’s tip number two, meet via video link instead of just teleconference. When you email or text someone, you only pick up on what they’re writing. If you’re on the phone, you pick up on their tone of voice as well. But when you see someone via video link, you also pick up on visual clues. 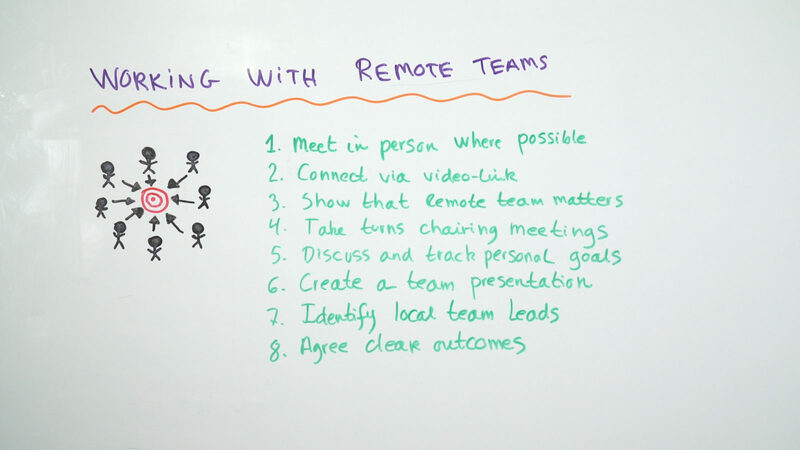 The third tip I have is to show that remote teams really matter. I often hear of remote teams feeling…They’re saying they feel like a bit of a satellite, and they don’t feel important. One tip I have here is to sometimes schedule meetings at a time that’s convenient for the remote team and not for you. For instance, if you’re in different time zones, that would really speak volumes. Another tip is to take turns chairing meetings. Again, it helps to distribute the power in the team. You can also discuss and track personal goals. You might feel this is a bit of a funny one, but think about it, you’re not together in the same location, so you don’t naturally small talk. You can track personal goals for team members. For instance, if someone is training for a marathon, why not have the whole team track it? It doesn’t have to take up that much time. You can also create a presentation about everyone. I did this once, I had 35 members on my team. We were in five different locations on two different continents. I asked everybody to send me a picture of themselves and include a short description of what they like to do in their spare time. Then I had three people per slide, and it created such a talking point; not just within the team, but also with our clients. Great tip, I recommend you do it. You can also identify local team leads because if you’re working with a remote team with several people, it might be difficult for you to speak to all of them. So identify a local team lead who you can communicate with. And if that person can come on-site and spend time with you, it will really help communication. And the last point I have here is to agree clear outcomes. Again, if someone is sitting in the same office as you, it is so much easier to agree expectations and to adjust as you move along. Not so with remote teams, so be extra clear about what you expect to get done and what a good outcome looks like.